You Can Expect Professional Dental Hygiene in Waco When You Visit! Since October is Dental Hygiene Month, dentists across the country are taking the time not only to address good oral care habits, but show appreciation to the dental hygienists who work incredibly hard to help thousands of patients every year maintain a healthy mouth. Without their help, the dentists wouldn’t have the time to address more serious concerns when they appear. 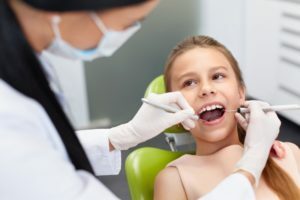 On top of acknowledging dental hygienists, you’ll learn what proper dental hygiene in Waco includes and other useful tips to know about on a daily basis. Dental hygienists’ main job is to remove plaque from the surface of teeth, examine patients for signs of oral disease and provide other preventive care. By doing this, the dentist can have a clear view of your oral structures and be aware of issues prior to coming into the operatory. You may have noticed that hygienists take the time to floss each of your teeth individually, which means they’ll be able to tell if you’re keeping up with your at-home enough. If you start to bleed from the gums, it’s a sign that gingivitis is present. Luckily, a professional cleaning and improvements at home can solve this issue sufficiently on its own. Finally, dental hygienists can educate you on the best products for your unique needs. For example, if you have sensitive teeth, they’re just as able to recommend toothpastes that prevent decay but also sensitivity. If you’re more susceptible to dental disease than most, they can recommend other products specific to you. It’s incredible how much we don’t think about our oral health until an issue appears. If you’re eating one of your favorite foods and all of a sudden your tooth is in pain as a result, it’s going to be a wake-up call. If your diet becomes increasingly limited because of a missing tooth, you’re going to start taking dental hygiene seriously. The problem is many people don’t start until permanent damaged has occurred. Additionally, oral health is more than simply about protecting your teeth and gums. Practicing good oral hygiene has major implications for your overall health as well. By keeping a strict routine, you reduce your risk of systemic conditions like heart disease, stroke, infections and pregnancy complications. Brush twice a day with a fluoridated toothpaste. Hold your brush at a 45-degree angle towards the gums and gently move back and forth in short strokes. Brush all surfaces of teeth and along the gum line. Brush the tongue and inside surfaces of teeth. Floss at least once a day, making sure not to snap when removing. Find a floss that threads easily in between teeth. Chew sugar-free gum for 20 minutes after meals to keep saliva production high. Eat a diet consisting of vitamin A, vitamin C, calcium, magnesium, potassium and other essential vitamins and minerals. Dental hygiene is a no-brainer as long as you have the right professionals and information at your disposal. Schedule an appointment with a dentist in Waco to protect your teeth! Dr. Rick Cofer earned his DDS degree from the Baylor School of Dentistry. He’s regularly attending seminars and other forms of continuing education in order to stay on top of advancements in dentistry. To learn more, you can contact him through his website. by: Dr. Rick Cofer at October 22, 2018 . Comments Off on You Can Expect Professional Dental Hygiene in Waco When You Visit!